Flying lessons are expensive and to extract the most value from your time in the air as a student pilot, it is sensible to make good preparations for your flying lessons.A professionally run flying school will make an allowance for briefing time before your flight begins. This is an opportunity for your instructor to run through the flying exercise to be practiced. However, this will be very much a pre-flight briefing and not an in depth lesson. Student pilots should also be self-briefing, at home, in the days prior to their next lesson. There are a number of excellent textbooks on the subject of learning to fly. Many of them cover the actual flying exercises in great detail. The flying lessons follow a pattern with each flight building on what was learned during the last lesson, so there really is no excuse for a lack of preparation. Regardless of this availability of good quality training materials, the one thing that impedes the progress of most low hours students is the lack of preparation for their lessons. If you can remember learning to drive, you will recall how, during your lessons, all of your attention was focused on the mechanics of actually driving. Navigation and safety were the concern of your instructor. Gradually, as you became more competent in your driving skills, you assumed more responsibility for the other driving functions. Well, flying is much the same. If you arrive at your flying school having at the very least read through the day's lesson you will free up mental capacity to actually fly the exercise. If your mind is still trying to assimilate the detail of the flying lesson from the pre-flight briefing, as you try to fly it, you will be putting yourself into an overload situation. Now, the flying school is not going to be too worried if it takes you 6 flying hours to learn how to fly straight and level. However, your bank balance will be suffering. If you take the time and trouble to prepare yourself for your lesson, prior to flight, you'll find that you will progress more quickly which ultimately will save you an enormous amount of money. At some stage your flying instructor will need to make the decision to send you solo for the first time. This decision is a lot easier to make in the case of a student who has always arrived for his or her lessons fully self-briefed. It instils confidence in the instructor and makes the student more competent too. 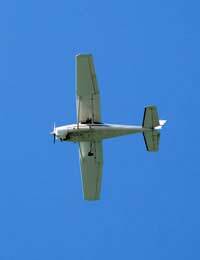 There are also other aspects to preparation for flying lessons that need to be considered. You should ask yourself whether you are fit to fly? Unlike your average 747, the Cessna or Piper, in which you will almost certainly be undertaking your training, is not equipped with a lavatory. If you have any digestive problems it is no time to be flying. If you are prescribed any medication you must check with your doctor whether this makes you unsafe to fly. It should go without saying that alcohol and flying do not go together. Although, as a student you will not be climbing to great heights, even at low altitudes the difference in air pressure can play havoc with ears, especially if there is any sign of ear, nose or throat health problems. For this reason you should not be flying if you have a cold. The weather plays an important part in the preparation for flying lessons. It will be a while before a student pilot is ready to fly in anything other than perfect conditions. This does not necessarily mean a sky totally devoid of cloud but it does mean a wind preferably pointing down the runway and no low cloud or precipitation. You should leave yourself sufficient time to reach the airfield prior to your lesson in order that you can mentally tune into flying mode. Arriving late to be ushered straight out to an aircraft without any chance to prepare is, frankly, a waste of time and money. All flights need extensive preparation, even for experienced pilots. To begin with, your instructor will be thinking about weight and balance considerations, fuel planning, loading and flight planning and navigation but gradually you will be required to demonstrate your abilities in these areas. Checking NOTAMS, getting weather reports, speaking to air traffic control at other airfields if you plan to land away: These things all take time and need preparation. You will hear in your lessons that a good landing happens as a result of a good approach. In much the same way, a good lesson happens as a result of making good preparations.